Does Engulfing Slagwurm's ability work before or durning combat? How does Engulfing Slagwurm work in combat? Whenever Engulfing Slagwurm blocks or becomes blocks by a creature, destroy that creature. You gain life equal to that creature's toughness. RxPhantom on Gore Claw's big boys. I feel like you need more ramp and card draw. 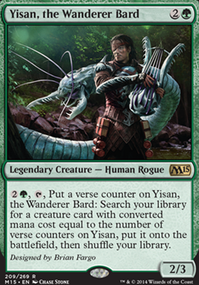 I'd ditch maybe one mana elf, and Into the Wilds for things like Nissa's Pilgrimage and Kodama's Reach/Cultivate. For card draw, Garruk's Packleader, Soul of the Harvest, and Elemental Bond are great engines for this deck. 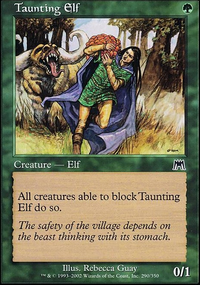 Overall though, my main piece of advice for a Goreclaw deck is this: if a creature can do the same/similar job as a card in your deck, use the creature, i.e. Archetype of Endurance instead of Asceticism. Oh, and a personal favorite of mine is Engulfing Slagwurm. 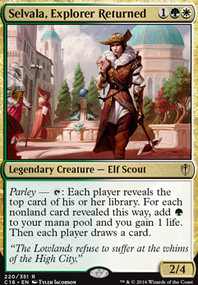 I have a question though, I'm intrigued by The Mending of Dominaria here. How do you like it? You may want to take a look at Shinen of Life's Roar; it works just fine on its own, but channeling it on Engulfing Slagwurm would be even better. And if you'd like, I have a deck featuring the partner commanders that you could check out; Bully Bullies is 83% competitive, and I think it's due to how much card-draw I've included; it has also won 3 out of 5 games. I actually do have Savage Lands in the deck... Just not on tapped out, so good catch on that one. I re-examined Endless Whispers and decided it NEEDED to go in, I forgot the trigger is not a "May" effect, so it can have a bizarre impact on the game. It would make games with creature sac-heavy decks quite unusual. I like the ability to suspend Search for Tomorrow for .. but for a similar base cost cultivate does give me better future oomph & this deck won't worry about too many cards in hand, so I probably will make that switch. Depending on how it plays out in a larger group I may end up putting more removal in, however I'm not especially concerned with this deck on strategy locks, even this: Peacekeeper won't kill me considering all the oddball groupslug I have thrown in. My other consideration is additional card-draw: Enchantress's Presence could do some real work in here considering I end up running almost as many enchantments as an enchantress deck. Last cards I keep going back & forth on are Engulfing Slagwurm Hypergenesis and Frenzied Fugue - Fugue is such a pet-card for me & it hits PERMANENTS so stealing planeswalkers for an extra round does have its appeal. 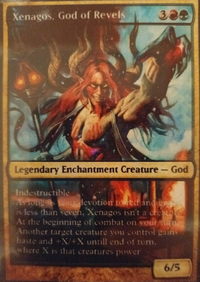 You could swap out the instants and sorceries so Vaevictis has a higher success rate. 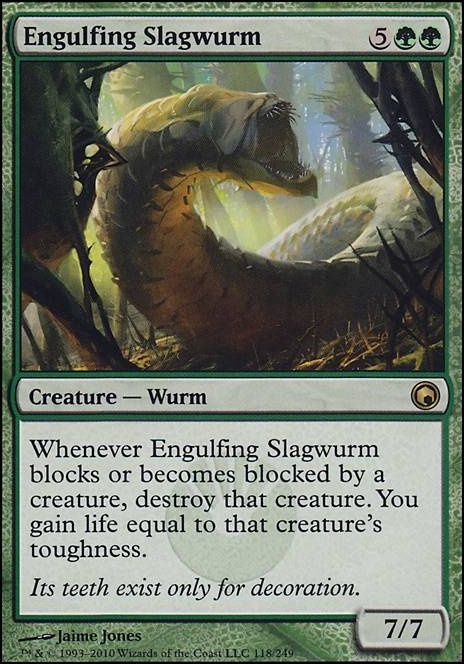 Engulfing Slagwurm is great to block any troublesome creature, or attack with it and force opponents to block. Flameblade Angel burns opponents when they attack or block you. Hornet Nest can give you lots of deadly tokens when opponents attack you. Dinosaurs with enrage like Polyraptor, Ripjaw Raptor, and Silverclad Ferocidons could be helpful. Similarly, Phyrexian Obliterator, Vengeful Pharaoh, Mikaeus, the Unhallowed, and Dread, with the Pharaoh being great to sacrifice to Vaevictis since it comes back, and Mikaeus bringing almost all your creatures back again. Vigor just protects all your creatures from combat damage and makes them even bigger. Living Plane and Nature's Revolt forces opponents to tap their lands or else attack with them. Massacre Wurm hurts opponents when their creatures die. Kothophed, Soul Hoarder will draw you a ridiculous amount of cards, but could kill you if your life is low. Platinum Emperion could be helpful for that, and also making attacks against you pointless. Savage Ventmaw and Druids' Repository give you mana when you attack, and can give infinite combats with Aggravated Assault.